This is a graph that the AGW cult doesn’t want you to remember. In 1988 the “settled science” team produced 3 temperature scenarios – A, B and C. Scenario C was modeled assuming that there would be ZERO increase in atmospheric CO2 starting in 2000. Guess which scenario our actual temperatures have tracked? 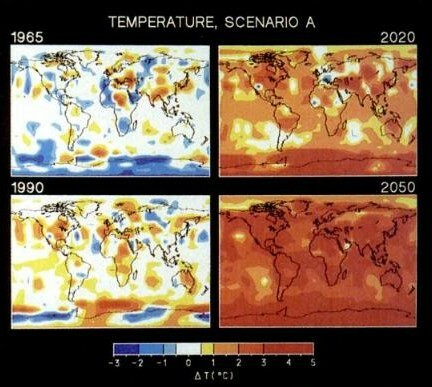 In 1988, the world’s greatest climatologist published these three possible forecasts for future temperatures. Scenario A assumes continued exponential trace gas growth, scenario B assumes a reduced linear growth of trace gases, and scenario C assumes a rapid curtailment of trace gas emissions such that the net climate forcing ceases to increase after the year 2000. The highest forecast, scenario A was Hansen’s expected “business as usual” forecast, as documented in this 1989 publication. So how did Hansen’s forecasts fare? 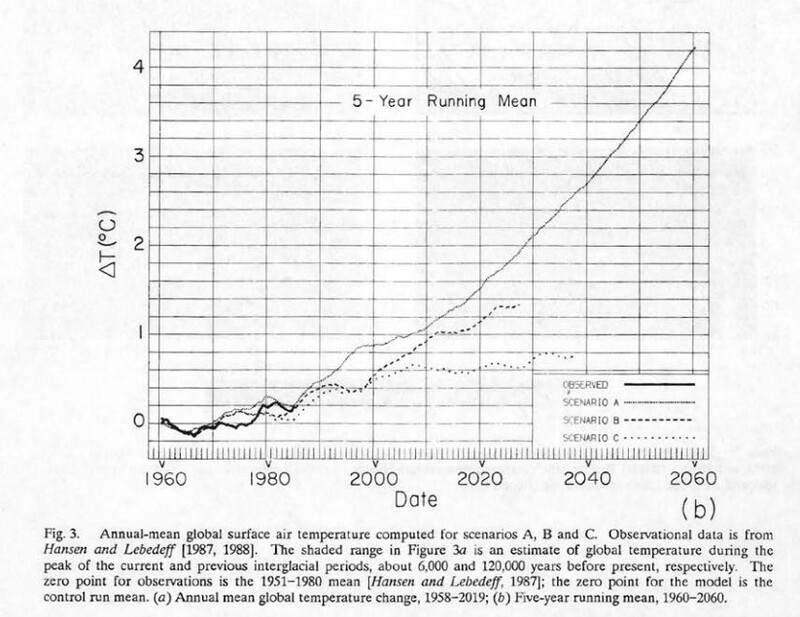 NASA five year mean temperatures are plotted in green on top of the 1988 graph below. They are tracking scenario C, which was based on zero emissions this century. This entry was posted in Climate Change, Uncategorized. Bookmark the permalink.